Builders Exchange of Kentucky maintains a list of companies which have expressed strong interest in a project on the Project Details page. This bidders list shows companies who will likely submit a bid on the project. Companies added to the Builders Exchange bidders lists come from a variety of sources, but they are most often taken from the official planholders list kept by the primary owner or design team for the project. These lists can often be found at the reprographics company which has been chosen to distribute project documents. Builders Exchange updates bidders lists a minimum of once every week before the bid date, with a final update the day before the bid date. 1. Navigate to the Project Details page for the project. 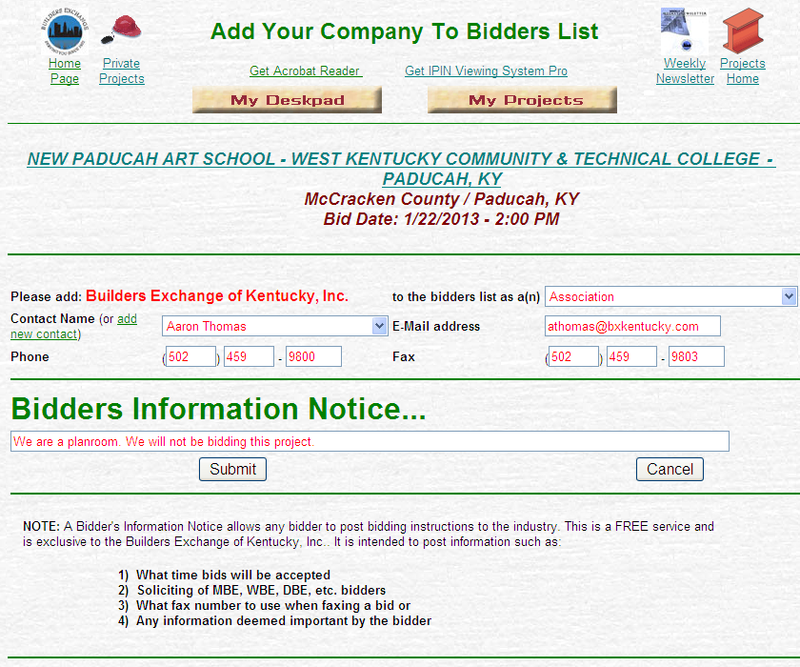 This is the main page of each project where details such as bid date, bid time, scope of work, bidders lists etc. are available. 3. On the next page, your contact and company information will be automatically entered and ready to submit. This information includes your name, company phone number, fax number, your company type/trade, and your e-mail address. You can change the main contact listed for your company by clicking the drop-down box next to “Contact Name”. If the contact is not listed, use the “Add New Contact” feature to add them. If you would like to change the trade your company will be listed under, click the drop-down box and select a different trade from the list. 6. 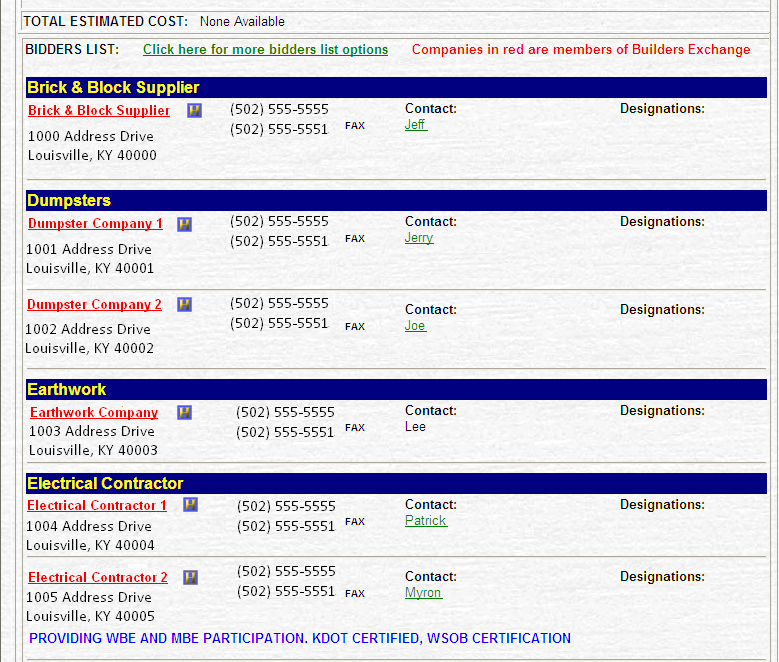 Click “Submit” and your company will appear in red on the Builders Exchange bidders list with all of your chosen details added. If you add your company to the bidders list but would later like it removed, contact the Builders Exchange directly. There is no option to completely remove your company from the bidders list once it has been added. 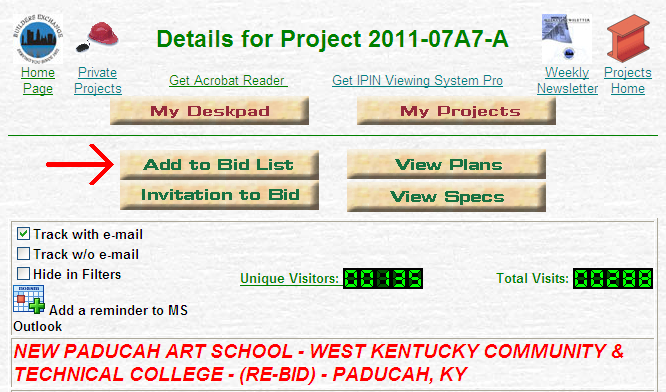 Call or e-mail Aaron Thomas at 502-459-9800 if you have any additional questions on bidders lists or the IPIN system. Thanks for reading and keep checking back for more IPIN tips, information on the construction industry, and Builders Exchange special events!